The double bass is the largest and lowest pitched bowed stringed instrument of the viol family. It inspired the greatest classical and contemporary composers, and can be found everywhere from the symphony orchestra and romantic repertory to chamber music and jazz…where the greatest improvisers held it in their arms. If you are wondering how your young child can handle such a large instrument, the best luthiers will respond with their expertise. 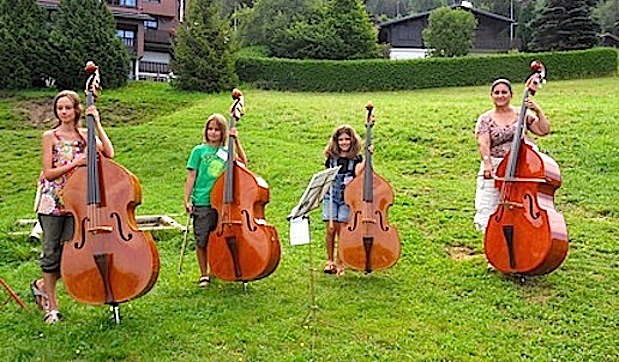 You will quickly discover how a 4 year old can play the double bass on a 1/32 size instrument, then on a 1/16, a 1/10, 1/8, 1/4, 1/2, 7/8… and finally a full size double bass! The instrument grows to follow the growth of your child. As a soloist the double bass is appealing due to its wealth of sounds. Its strings are both plucked (“pizzicato”), and bowed (“arco”). The instrument can produce a dizzying range of vocalizations. We welcome you to join us in Paris, Lyon, Marseille, and La Ciotat, to make the strings vibrate! You will find yourself in a world filled with new wonders and experiences. See you soon !